**Greenmarket Taste & Tour is a program for senior centers and nonprofit/community-based organizations serving adult communities. If you are seeking a Greenmarket tour for an international delegation, university students, government officials, or professionals in agriculture, click here. Greenmarket Taste & Tour connects New York City senior centers and nonprofits serving adult communities with their neighborhood Greenmarket and its farmers. Our nutrition lessons enhance awareness of how food choices impact our bodies, our communities, and the environment. Greenmarket Taste & Tour provides fun, social outings and cooking demonstrations that benefit the physical and emotional health of New York City’s adult communities. The Greenmarket tour focuses on the concept of local, seasonal food. A brief introduction is followed by an exploratory walk through the market, including Q & A with farmers, a tasting of Greenmarket farmer products, and take-home recipes. Participants will also learn about services available at Greenmarket, such as SNAP/EBT, textile recycling, and composting. When/Where: Tours are outdoors and may be scheduled at any weekday Greenmarket location. Tours are limited to 20 participants, Monday-Friday March through December. Groups are encouraged to tour their neighborhood Greenmarket to experience what is readily available within their community. Tours are 45-60 minutes. Here is a full listing of our markets. MARKET RIDE: Through an arrangement with the NYC Department of Education and DFTA, school buses can be booked by DFTA (Department for the Aging) community partners to take seniors on shopping trips between the hours of 9:30 and 1:30, October through May, when school is in session. Market Ride takes seniors to supermarkets, Farmers Markets and other greengrocers where they can purchase nutritious food. Trips must be booked four weeks before trip date. To book a school bus for your tour, please contact DFTA by emailing dftaschoolbuses@aging.nyc.gov or calling their office at 212-602-4452. The Center for the Independence of the Disabled, NY, posted a website with Access-A-Ride drop off/pick up sites for every Greenmarket. These addresses can also be used to arrange buses. HEALTH BUCKS: When funds are available, tour participants may receive a $2 voucher to purchase fresh fruits and vegetables from Greenmarket farmers at the end of the tour. You may request a Greenmarket presentation at your center. Presentations will introduce the Greenmarket, who we are, where we are, and what we do, include information about benefits accepted in the markets, including SNAP/EBT, Health Bucks, and more, present information about healthy eating, and include a cooking demonstration using Greenmarket produce – with a sampling for attendees. This presentation is typically done prior to the Greenmarket tour as an introduction to the market. When/Where: Centers must be located within ½ mile or 5 subway stops* of a Greenmarket location. Presentations may be scheduled at any time of the year, but should occur before the Greenmarket tour. Presentations are 45-60 minutes, and we do not limit the number of attendees. *Limited exceptions can be made to this distance on a case-by-case basis. 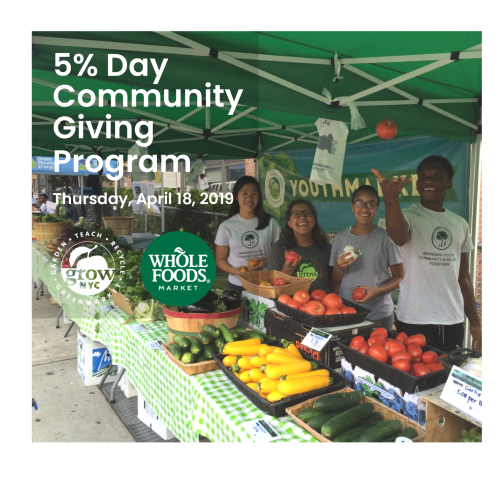 Please contact Susie Spodek: sspodek@grownyc.org for more information.